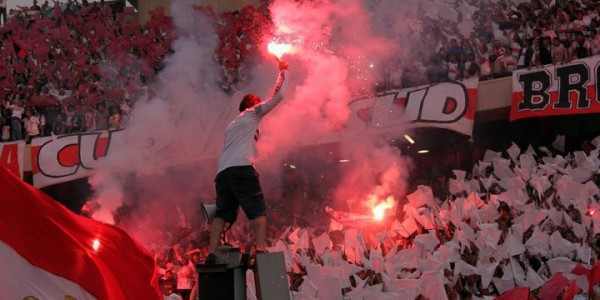 The high spirited Ultras who are the single most dedicated protest group that has countless defended the revolution. Today clashes erupted around the US embassy in a very reminiscent scene of the night the Israeli embassy was “stormed” as the international press coined it. But is that scene that too reminiscent? Are they the same? True the Egyptians at the US embassy did not “storm in” rather they threw rocks, at the Egyptian military after Tawfiq Okasha and his gang of ex-NDP members heralded there to supposedly protest against the Americans on trial who left, against the Ambassador and aid. Anyone that has half a brain will immediately realize that he suffers from schizophrenia; how can you protest against aid that reaps the patronage of the ‘Generals’ who smuggled out the Americans? How can you stand on the military’s side of the rock throwing, instigate fights and yet be anti-America? Simple answer is all about the fact that unfortunately the military is still in a Mubarakist paradigm. They want to be able to play both sides, be part of ‘Pax Americana’, export gas to Israel, but also be the ‘nationalists against the imperials’. And it is that type of thinking that is all about ‘holiganism’ and anarchism. For that I shift to the night the Israeli embassy was attacked. This narrative a la US-embassy-in-Iran-hostage crises has a number of facets that must be explored. There is more than meets the eye. Tomorrow all the world will compare it to the classic ‘hooliganism and anarchism’ of the Egyptian people. People might even quote Brenard Lewis and Samuel Huntington that we are just too ‘violent’ for democracy. Its not in our “system”. We go to a football game and we kill each other like in Port Said. In so doing they will bring back pictures of protesters that are ‘funded’ by the ‘foreign hand’ but no one will fail to say that the military had a strategy of hit and take a step back. Two steps forward…attack one step back. Until they withdrew and there was a security vacuum in front of the embassy. This raises larger issues about the longest lasting sit-in in Egypt today: the Omar Abdel Rahaman people right next to embassy. These people protesting for their leader to be released who is responsible for instigating terrorist acts in the US. Seems to be quite odd at the very least considering that most protests have never had a longer shelf-life of 3 months. This same strategy in securing the US embassy was used at the Israeli embassy. No one talks about group dynamics, the high spirited Ultras who are the single most dedicated protest group that has countless defended the revolution in much unpublicized narratives such as the night of battle of the camel. This is the other side of the coin, if so to speak, of the narrative that the MB uses to empower its legitimacy to the revolution. Just as they claim they were the heroes on battle of the camel no one talks about the night of it where there were fireballs being thrown and utilized by the Ultras. All these narratives speak to much larger claims. Claims of power by knowledge. It is a very subtle claim to a reality that is perplexing and can emancipate. It is not my interest to debate if it was them who threw rocks or their participation but it is important to understand how they have a very high spirited sense of dignity in the face of submission and acquiescence. Thus today’s episode must be read with caution, while countless observers are saying this is a trap, and this is not our battle people must be more attuned to the threshold of perception. Once something is associated so readily with you it becomes dominating. After that people regularly believe it without questioning it. It is my hope, and I have only attempted to do that hopefully to an avail, that by writing this viewpoint gets out and shapes the reality. Instead of waking up the next day and discovering that 6th of April is the group that wants to destroy Egypt where in fact it was that group that initiated among others the call to protest on January 25th 2011.